Spring has SPRUNG!! We are giddy, we know you are too! 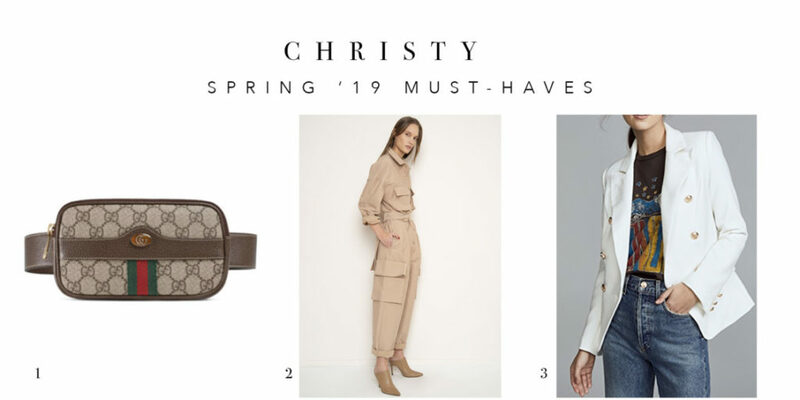 We’ve already been hard at work in our clients’ wardrobes, purging, shopping, and outfitting for this season and now that the weather appears to be on our side, it’s time to step out in those new duds and sport the style that speaks to you! 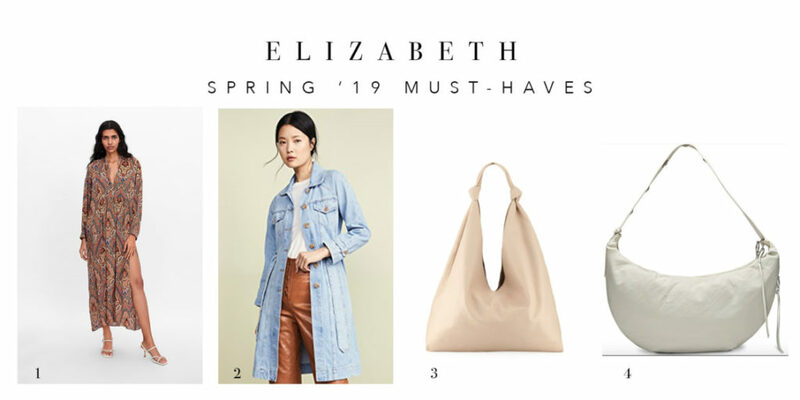 Our team pulled 3 of our must-have pieces we’re each coveting for Spring to show you what we’ll be wearing! 1. PAISLEY DRESS: I’m a sucker for a dress. Especially one that is a bit oversized, what can I say? I love this paisley print dress, and the v-neck is perfect for me so that I don’t completely loose my shape. I love the idea of pairing it with a good cross body bag for a day of shopping with clients. ZARA Flowly Printed Dress, $69. 2. BELTED DENIM TRENCH: I can’t stop thinking about this little number (which usually means, I have found a good one for me). I have it played out in my wardrobe a million ways, with a t-shirt and high waisted denim, styled open over a maxi dress, dressed up, dressed down…the possibilities are endless! ei8htdrweams Belted Denim Coat, $350. 3. HANDBAG #1: While I have a BIG birthday approaching, I keep telling myself to go for it… I’m totally inspired by this bag. The shape is practical for fitting everything under the sink into (which is just how i like my bags). The Row Bindle Double-Knot Hobo Bag, $1490. 4. HANDBAG #2: But if I can’t get the guts up.. then I’ll probably settle for this.. which would make me happy too! Rebecca Minkoff Nylon Hobo, $168. 1. NOVELTY BLAZER: I am loving that blazers are such a “key” item for the season! While I do have a few blazers in my closet, I want to focus on layering in a novelty one. Something funky and fresh. I love this drapey, yet structured blazer by Scotch & Soda. Scotch & Soda Drapey Blazer, $165. 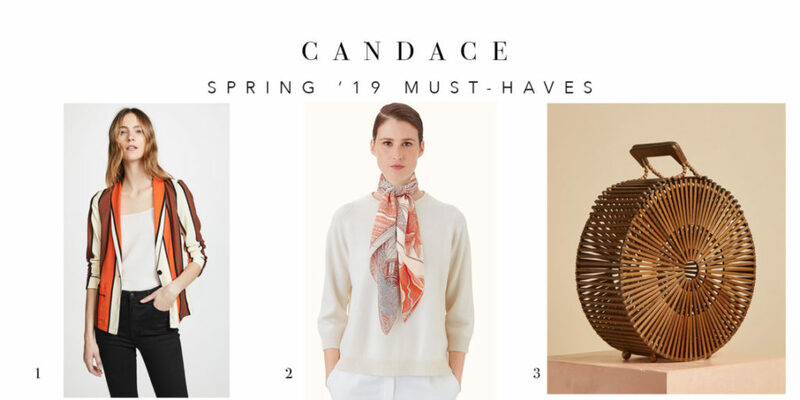 2.SILK SCARF: With the silk prints here for the season, I feel like this is the PERFECT opportunity to make the investment in a Hermes scarf. I love this one that has just a touch of orange, one of my preferred colors to wear and also a sunshine color! Hermes Acte II, Scene I, La Clairiere Scarf 90, $415. 3. BASKET HANDBAG: I don’t think I have ever shared this with you all, but I have a handbag obsession and this bag from Cult Gaia is just everything. It’s basket-like and complete with a sleek top handle…yes! Maybe I’ll even adorn this bag with my new Hermes scarf. Cult Gaia Zaha Bag, $215. 1. FANNY PACK: The fanny pack might be my favorite accessory right now. I love that it can be paired with any outfit. This classic Gucci is speaking to me, I may have to splurge. I like wearing them at my waist, but this would look great worn with a blazer cross body. Ophidia GG Supreme Canvas Belt Bag, $750. 2.UTILITY JUMPSUIT: Who doesn’t love a jumpsuit?! The utility trend is right up my alley…I love mixing tomboy and feminine together for a perfect juxtaposition. This jumpsuit would pair nicely with the fanny pack and sleek pumps for evening..but worn with a bootie or (gasp) a sneaker for daytime! The Frankie Shop Khaki Patch Pocket Utility Jumpsuit, $255. 3. WHITE BLAZER: I’m loving the white blazer at the moment…styling my clients and myself in this crisp style with jeans and a great blouse, with a good fitted tee and shorts in the Summer, over maxi dresses, and even a great maxi skirt and concert tee. Love all the options that blazer gives us! Lioness Palermo Blazer, $88. Call us today to pick the favorite items YOU should add to your wardrobe!